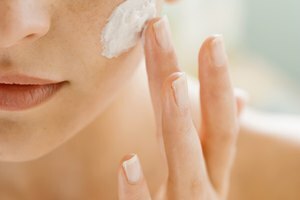 Moisturize frequently to prevent dry skin from peeling. If that afternoon nap in the hammock turned into an afternoon sleep fest in the sun, a nasty sunburn is the likely result. If your dehydrated skin feels tight and peels like an onion, some major moisture therapy is in order. Intensive hydrating -- both inside and outside your skin -- is just the thing to make your skin feel and look better. Grab a few household ingredients and take some time to pamper your dry, delicate skin. Fill a bathtub with cool or lukewarm water and add 1 cup of a bath soak containing oatmeal. Get into the tub and soak for at least 10 minutes to allow the oatmeal to soothe and hydrate your skin. Apply a dime-size amount of a gentle body wash, not soap, to a washcloth. Wash the peeling areas of your skin very gently using circular motions to remove the dead skin. Dry your skin by gently patting it with a soft towel. Don’t rub the skin harshly, as this can cause further damage. Apply a quarter-size amount of after-sun lotion to your palm and spread it liberally over all sunburned areas. Look for a lotion that contains aloe or cucumber, which both hydrate the skin and help prevent additional peeling. Drink at least eight 8-ounce glasses of water per day to replace the moisture lost due to the burn. Squeeze a quarter-size amount of a broad-spectrum sunscreen into your hand and spread it over your entire body before going outside. Better yet, stay indoors as much as possible until your skin begins to heal. Once your skin is no longer red or feels sensitive to the touch, switch to using a lotion containing alpha-hydroxy acid. This acid will speed the skin cell turnover and eliminate the residual peeling. Avoid washing with soap until your skin heals fully, as it is too drying. Do not use a loofah, body scrub or other abrasive item on peeling skin, as these products can damage the new skin underneath it. If you have a fever, chills or excessive pain, see a physician immediately; this indicates a more severe medical issue. Don’t peel off your skin if it does not come off with gentle exfoliation. This can lead to infection or scarring. Johnson, Kimberly. "How to Help Dry Skin After a Sunburn." Synonym, https://classroom.synonym.com/dry-skin-after-sunburn-13185.html. Accessed 23 April 2019.